Passengers at America’s Friendliest Airport® can now easily view checkpoint wait times in a variety of ways. Wherever you’re heading, if you’re traveling during the holiday season, you need to realize that everyone else in the world is, too. But don’t let long lines at airports get you down. Passengers at America’s Friendliest Airport® can now easily view checkpoint wait times in a variety of ways. Patricia McCarthy was flying to Palm Springs, Calif., and it was her first time at Phoenix Sky Harbor. 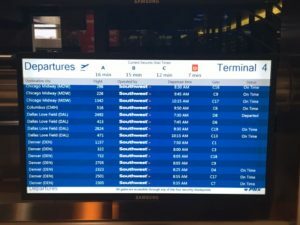 She looked at the flight information display in Terminal 4 and breathed a sigh of relief. Passengers like McCarthy may now view security wait times before they travel to Sky Harbor and again when they arrive at the Airport. 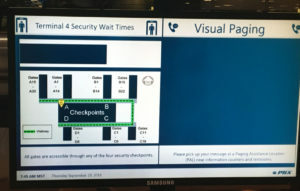 Checkpoint wait times are now available: on the Airport’s website, skyharbor.com; on Flight Information Displays in the Airport terminals and PHX Sky Train® stations; and on Sky Harbor’s visual paging screens in the terminals. This amenity will be especially helpful for customers traveling through Terminal 4, since passengers can use any of the four security checkpoints in that terminal to access any gate. Terminal 4 serves more than 80 percent of Sky Harbor’s customers. This new technology calculates the time it takes for the passenger to complete the entire security screening process. The timer begins when the traveler gets in line at security and ends when the traveler picks up carry-on bags after the screening process. The wait times reflect conditions in the regular screening lines, not TSA Pre-Check. The new service is now available at the Terminal 2 and Terminal 4 security checkpoints. It will be available in Terminal 3 after the new, consolidated checkpoint opens later this year as part of the Terminal Modernization Program. For additional travel tips and airport information, please visit skyharbor.com.